I just got back home from an extended stay in Los Angeles (you can find pictures here and here) and of course I had to try some cupcakes. After all, they are american, right? At least I think so. Anyhow, I love cupcakes because of the countless combinations of cake and frosting. And the small size makes them perfect for sampling many different flavors :) In Beverley Hills I spotted the famous cupcake Bakery Sprinkles and I just had to go in and buy something, all in the name of research, of course. Have you seen the Cupcake ATM they have next to the store? SO cool. After I did some serious thinking I got the Vanilla and Milk Chocolate Cupcake, mainly because: 1. You can never go wrong with such a classic combination and 2. I don't like buttercream and it was one of the cupcake flavours made with cream cheese frosting instead. And trust me, this little calory bomb did not dissappoint. I had eaten all of it before I could even leave the store, it was that good. The cream cheese frosting was tangy enough to really let the chocolate flavour shine and the vanilla flavour of the cake itself wasn't overpowering. A great combination of texture and flavour! Right then and there I decided to try and bake the same cupcake at home. I researched recipes on the internet and went right to work, as soon as I was home. And after some tweaking and some testing, my friends, who double as my guinea pigs when it comes to my baking, said that the cupcakes taste amazing! 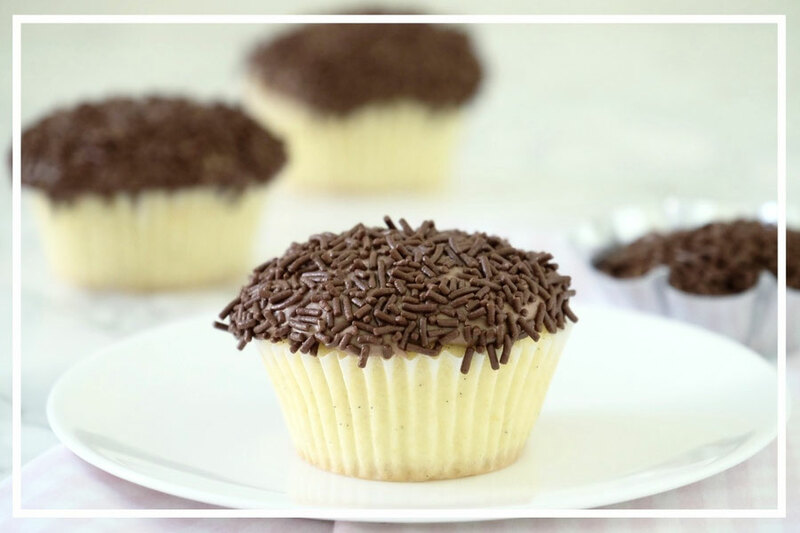 The cupcake is moist yet airy at the same time and not to sweet, this way the chocolate frosting can really shine. If you're looking for a crowd-pleasing cupcake recipe that is just as delicious as it is easy to make, this is the one for you! Preheat your oven to 175°C. Line a muffin tray with cupcake liners. Beat the butter and the sugar until light and creamy. Cut the vanilla bean length-wise and scrape out the seeds with the back of a knife. Add the vanilla seeds to the butter. Add the eggs to the butter, one by one and mix well until incorporated. In a second bowl, mix the flour, baking powder and salt. Add the dry ingredients to the batter and whisk until incoporated. Add the milk and whisk it all together. If the batter is too thick, add a little bit more milk. Fill the cupcake liners evenly about 2/3rds using a spoon or an ice cream scoop. Bake the cupcakes for 15 minutes, insert a skwewer after the 15 min are over to see whether they need to bake a few more minutes. When they're done, take them out of the oven and let them cool completely before thaking them out of the muffin tray. Melt the chocolate in a water bath (in a bowl over simmering water) and stir every now and then to melt it evenly. Afterwards, take the chocolate off the heat and let the chocolate cool down. Sieve the powdered sugar and add it to the butter. Mix everything until creamy. Whisk in the chocolate. If the frosting is too liquid, add some more powdered sugar and spreadable. Cooling down will also harden the frosting. Use the frosting immediately on the cupcakes or refrigerate it. 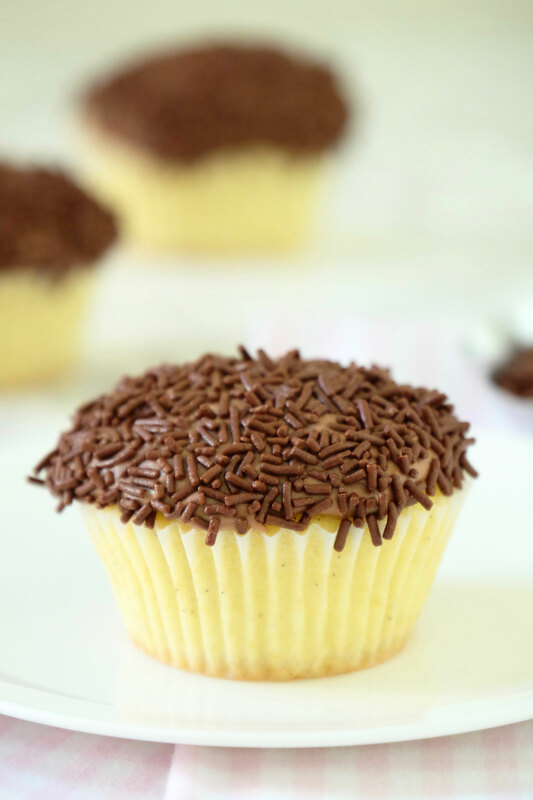 I have chosen best resources on vanilla cup cakes with chocolate cream frosting updates. So prefer every topic on cake and soul reviews. Thanks for given everything to provide every user.